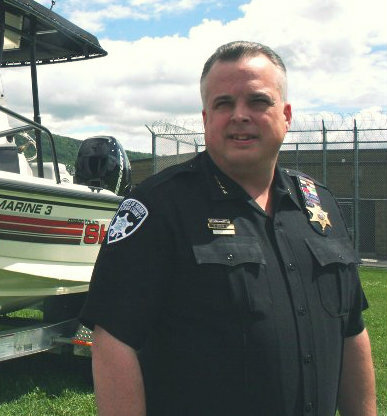 Sheriff Richard J. Devlin was elected to his first term as Otsego County Sheriff in 2006. Sheriff Devlin began his law enforcement career serving with the United States Army Military Police Corps. 61st MP Co. in Hanau, West Germany. After his discharge from the military, he was offered a position with the City of Oneonta Police Department where he was a patrolman for 4 years before transferring to the Otsego County Sheriff’s Office. Sheriff Devlin joined the Otsego County Sheriff’s Office in 1992 and has held the positions of Deputy Sheriff, Investigator and Sergeant. Sheriff Devlin is an Eagle Scout recipient and is very active with the Boy Scouts organization, serving as an advisor for the Sheriff’s Office and local Fire Department explorer posts. He has been a volunteer firefighter with the Milford Fire Department for over 29 years and has served as its Fire Chief for the past 10 years. Sheriff Devlin resides in Milford with his wife Laurie and 2 of their three children.